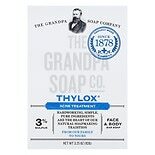 Shop Grandpa's Thylox Acne Treatment Soap with Sulfur (3.25 oz. )3.25 oz. $399$3 and 99 cents$1.23 / oz.